Topps' sophomore effort may have as impressive and/or better images than their first release in 1991 - the problem for me was Topps turned Stadium Club into a bloated 900 card set, issued in three series of 300 cards. It was the first Stadium Club product I remember picking up with some sort of regularity, but it also became this monster, clusterF of a set littered with unproven players and players who'd be the 25th man on a roster. It should have remained a 600 card set like the initial release in 1991, but Topps thought they could capitalize on the initial popularity of the 1991 set. The Van Slyke [card #232] features a very nice horizontal shot of Van Slyke diving with a head first slide at third base - you can see Pittsburgh Pirates' then third base coach Gene Lamont kneeling to see what will happen as third baseman Tim Wallach of the Montreal Expos presumably awaits the throw from the cutoff man. The only reservation is the photographer is able to catch Lamont and Wallach's butts lined up with the image of Van Slyke's impending slide. The Hoiles [card #161] features a play at the play - we don't know if the runner is safe or out as he crashes home, kicking up dirt as Hoiles is looking for the baseball. Surhoff [card #117] looks like he is making the throw on a pickoff as Ken Griffey Jr. tries to get out of the way - I can eat up 'bonus babies' or common cards featuring cameos by stars all day long. I like this card because the subject looks like an inmate in some jail [or a super fan] showing off his cell [or a 'man room'] - with an unhealthy fascination for a Major League pitcher [look at the multiple jerseys, look the subject wearing a pinstriped jacket, pants and socks]. I wonder how many letters has he written to his favorite Major League player? I haven't gotten involved in one of these blog question and answer posts - but I'm trying to do something in involve myself in the hobby. One of those ways is answering questions to give you a chance to reflect and share a little about what makes you a collector. 1-If I didn't collect baseball cards, I'd collect - books about baseball, its players and its history. I don't know if I consider baseball players heroes, but then I guess I like the idea of this Ichiro fellow - I kind of got swept up in the bandwagon in 2001, wondering if this 'cat' was going to stick and through 2008, it doesn't look like he is slowing down. I still put this guy up on a pedestal because of a number of reasons - he is one 200-hit season from cracking the 2,000 hit mark [he already has over 3,000 hits if you combine his Japan totals and his Major League Baseball totals] and has an outside chance of getting 3,000 hits. He plays for an organization that has crumbled over the last four or five years but for better or for worse, he continues to put up some decent numbers. 3-Every New Years I resolve to - organize my collection since it is my Achilles' heel. Over a given year, cards get piled on top of each other and while there is some organization in place - cards are sorted out for a number of reasons and I get lazy to put them back where they came from. 4-If I could spend a day with one person from baseball history, it would be - Babe Ruth; you want to know everything about living large, then you have to spend a day with the Babe. 1-What is your favorite kind of dog? Any kind of dog. 2-Who is your favorite baseball player? Tim Salmon, because he was the first Halos' top prospect who came up through the early 1990s and established himself as a franchise star. One of my baseball card collecting 'games' back in the day was trying to pick out players' cards who were going to be future stars - I wasn't Billy Beane or nothing with Moneyball, but I'd pick out some cards out of the commons box of a friend perhaps [I thought most cards I found were rookies, but they could have been second year cards of young players with minimal stats lines on the back] and see if there was a player who was going to star when given a chance [I remember Paul Sorrento and Ed Sprague]. As Salmon started to put it together as an elite prospect back in the early 1990s, I traded for his 1991 Bowman rookie card - it was only worth a quarter [and probably is still only worth a quarter today], but I figured he was in an Angels' uniform. Salmon made his Major League debut in 1992 for a cup of coffee and won the American League Rookie of the Year the next season - he was the face of the team through the late 1990s and despite battling injuries and down seasons, had a prominent role in helping the Angels win a championship in 2002. He is held in highest regards by Angels' fans. 3-What is your favorite team? Los Angeles, California, Anaheim, Los Angeles Angels of Anaheim Angels; my two Little League teams were the Angels and the A's. The Angels are the 'hometown' team to this day, though back in the early 1990s, there was some 'team envy' when you had Dave Stewart, Jose Canseco, Dennis Eckersley, Mark McGwire, Dave Henderson, Rickey Henderson among others flexing their muscles for the A's in the American League West. The Angels of the early 1990s seemed like 'pretenders' compared to the A's. 4-What is your favorite baseball movie? Bad News Bears or Mr. Baseball; there was something authentic about Bad News Bears and it wasn't really just a sappy,feel good baseball movie for kids. Mr. Baseball dwells on the fictionalized experiences of the 'Gaijin' [or foreigner] ballplayer thrown into a different culture and it is kind of a poor man's Bull Durham as far as the nuts-and-bolts baseball action is concerned. 5-What is your favorite baseball book? Ball Four by Jim Bouton; it was a radical book and something frowned upon by the baseball establishment. Despite being blackballed for putting out the book, Bouton gave readers an opportunity to see what ballplayers were really like as opposed to sugarcoated accounts written up by ghostwriters or reporters who still believed they could enjoy relationships with the superstars they lavished glowing praise on. 6-What is your favorite card? 1985 Topps Mark McGwire #401; I don't know if I have a definitive card to talk about but I picked up a card like the one pictured for $5 at the 1996 National in Anaheim. Fast forward to 1998 and a professionally graded version [maybe a PSA 10 or BGS 9.5] of this card was going to pay for part of someone's college education at a community or state college perhaps. The Tiffany version may have paid for someone's college education at decidedly better schools. Having this card back in 1998 sort of made me feel like I had a little piece of the home run chase between McGwire and Sammy Sosa - this card is only a $5 card once again, but for a while it was the key rookie card of MLB's premier steroid taking Paul Bunyan-esque home run hitter and I was riding the wave like everyone else. 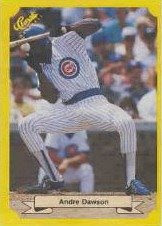 People were either talking about McGwire or Sosa's daily performance and/or saying they had their rookie cards. 1984 Fleer Kevin McReynolds #307 - when I started following baseball through baseball cards in the early 1990s, McReynolds always struck me as a very pedestrian, mediocre player. He was winding down his career and there was nothing impressive about his numbers. I guess he was supposed to be a 'future star' with the San Diego Padres [an outfield of McReynolds, Carmelo Martinez and a young batting star named Tony Gwynn was going to be the Padres' outfield for years to come] but a player who blossomed for several years in New York instead. 1983 Fleer Howard Johnson #332 - I have memories of owning this card for about two or three weeks, dating back to my very formative years of collecting 20 years ago. The memory isn't something to revisit and however ironic, I'll quote great Mark McGwire and say, "I'm not here to talk about the past." Johnson was one of those 'late bloomers' who was a platoon player early in his career, but he became a slugging star for the New York Mets through the late 1980s. This was probably his key card at one time and it took a year or two more before Donruss and Topps printed up their first HoJo cards. 1983 Fleer Gary Gaetti #613 - he was star third baseman for the Minnesota Twins during the mid 1990s and California Angels' veteran free agent signing 'bust' in the early 1990s. Somehow he found the juice to re-energize his lagging career after leaving the Halos. He is in the Minnesota Twins Hall of Fame. 15 count repack box from Fairfield [$9.99 each at a Target] - I'm not going to be suckered into a repack box of any kind, but a clear 150 count plastic box labeled 'Fire Sale - 15 baseball packs' caught my eye. I could probably get the box for a buck, but it looked there seemed to be a handful of packs crammed inside. Most of the packs were assorted Topps brands from the last several years - they were the cheap retail $0.99 packs with six cards inside instead of full retail [or hobby packs]. One random pack was a 1989 Topps pack and no picture of this dreck is needed - the cards inside were bent [warped] in a weird way. The bottom card had slight wax stains, but the stick of gum was nowhere to be found and cards in the pack are off-center. My philosophy on wax packs is people have probably searched packs, even from ridiculously crappy years of cards - my guess is so they can find cards to grade since a PSA 10 of a base star card maybe worth $15, $25 or $100 in some cases. There is no 'safe' product to bust. I don't care about value when there is none, but I kind of wish the packs I choose to open are 'clean,' unlike this one. Unscientific guide - consult an 'pack expert' as far as seals are concerned. 1.) Pulling a star or rookie of value - may seem an odd assertion, but pack searchers with some nefarious plans are cherry picking packs, while putting 'key' cards of lesser condition in the packs they search and reseal. 2.) Off-center cards or generally cards in shabby condition - packs are likely searched if there is a string of cards featuring miscuts, off-center cards and various imperfections. Another random pack was a 1992 The Baseball Enquirer 'mystery interview' cards - I kind of like these cards, though the company can't associate the parody images/interviews with any of the real Major League Baseball team and/or players it may [or may not have] chosen to depict. It is pretty simple to figure out the 'stars' from the set, though there is really no ID on the cards, not even a make believe name. The pack features a shaggy haired caricature of a ballplayer - saying "I'll bet my card's going to be worth a fortune." #44 - my best guess is Jeff Reed - as the unknown Reds' player [Edit: The image depicted is actually former Reds' manager Lou Piniella]. #52 - Harry Caray [Edit: The image depicted is actually former New York Yankees' announcing great Phil Rizzuto]. Witt was the workhorse ace for the California Angels in the 1980s until all the innings he pitched took a toll - and his arm was burnt out right as he hit 30. 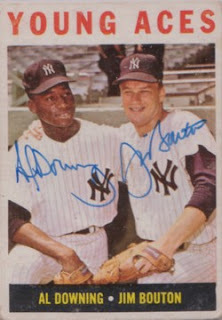 Witt finished his career with the New York Yankees in 1993 after being traded for eventual Hall of Famer Dave Winfield in 1990 - he threw a perfect game in 1984 and was part of a combined no-hitter in 1990 with then Angels' big free agent signee Mark Langston. Too bad your ugly mug won't be playing in Anaheim for the next eight years - for half a season, you gave the Angels a shot in the arm. Besides your offensive contributions in the second half of the 2008 season, one thing that impressed me was your athleticism at first base. Can't really say 'good luck' to you in New York - but maybe you are following in your childhood idol's footsteps [Don Mattingly, as I have read]. You'll probably put up similar numbers as you have in your Major League career and as professional as any modern day ballplayer can be, you won't be the type to crumble under the New York spotlight. To everyone else - Merry Christmas, happy holidays and may the new year, bring a new hope. 'Fat Elvis' does his best Jumpman logo impression - while trying to make the catch at the wall. This card just reaffirms my belief 2006 Upper Deck as probably the most attractive, no-frills, no cards worth $$, base set in this decade. I'd like to display this card 50 different ways as a centerpiece of my collection, even though I don't actively collect Berkman and I'm not a fan of the Houston Astros. It maybe hyperbole, but 2006 Upper Deck card #213 is what the modern baseball card is all about in its simplistic, most basic form. I found this card in a nickel box at a place where I get random cards - unlike many other Dawson baseball cards, where he is grimacing and/or is seemingly in a serious mood, he is actually looking at someone and smiling. Dawson is in the prime of his career and while playing on Astroturf will have consquences for his later health, Dawson is just beaming. Is this a nickel card of a player soon to be enshrined in the National Baseball Hall of Fame [?] - who knows really, but Dawson put together a impressive resume that showcased his ability to hit for power and for speed. Dawson's 1987 Classic Yellow card #124 probably captures his worst moment as he hits the ground - Classic, which produced trading cards revolving around a baseball themed board game, used the same image as a 7/20/87 issue of Sports Illustrated titled, 'Beanbrawls' with Dawson on the cover. 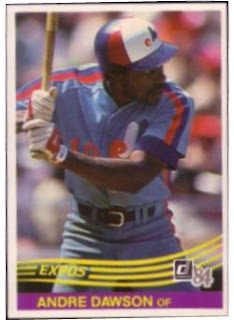 Dawson's 1984 Donruss card #97 - is a favorite because the focus is squarely right on Dawson. His eyes are focused on the incoming pitch and it looks like he is ready to hit one square up the middle. Now his ex-girlfriend's lawyer is suing him and had just released the tape - since this happened in 2006, it had already been swept under the rug or people were just oblivious to it. Giles seems like a 'wild and crazy' guy [I've seen a clip of him running naked into Tom Glavine, Greg Maddux and John Smoltz interview] - but since he is generally is considered a model citizen on the field, I don't know if he can 'cross over,' like only a few athletes can where there is some genuine scorn whether or not he fits the stereotypical athletes, the mainstream media really likes to make examples of [and I'm not talking about a crackhead like Matt Jones in the NFL who we have not heard one peep about]. The typical response from the peanut gallery [not that I consider myself above the fray] would probably consider the ex-girlfriend a gold digger - and feel like let's not all just jump on Giles because all the facts have not come out yet. However, it seems no amount of evidence would convince the fan base otherwise - certain athletes like Giles are capable of such committing such disturbing behavior. If we are not talking about someone we personally know, but someone we admire or watch like a professional athlete - that maybe the most disturbing aspect when things like this come out for public consumption. When I got home [on Monday], I saw there was a box - I knew it a box of cards for me, all for free. I really haven't been a beneficiary of all sorts of goodies [random or not] through the world of baseball card blogging, but I was able to happen to stumble upon a blog giving away free cards. 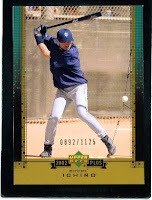 I counted out 171 assorted cards - besides two cards [1998 Score Jim Leyritz and a 2005 Topps Update Home Run Derby subset card of Troy Glaus], all were 2000 Topps. It was kind of odd because I thought I'd be getting a box of strictly Angels' cards. A number of them were cards of all-stars, superstars and stars of the past 10 seasons, though what I paid attention the most was any cards I could funnel into my collecting topics collection - I was able to find a handful of cards fitting various topics, so getting different cards [these were free] sort of paid off. Short of being a junkie, I like going through as many assorted cards as possible as long as they aren't 1988 Donruss or 1989 Topps. After going through the 'other cards,' the 'second part' of the box featured 115 assorted Angels cards - including a bunch of the cards of the team's star players over the last 15 years like Vladimir Guerrero, Tim Salmon, Chuck Finley, Chili Davis, Brian Downing, Jarrod Washburn, Adam Kennedy, Gary DiSarcina, Darin Erstad, Garret Anderson, et al. I spent much of Monday night sorting 286 total cards - in the end, I didn't know what I was doing, but I'm silly like that. The least I could is play with the cards. I cut a Garret Anderson up to crudely mimic what I saw done to make a card appear '3D' at the blog Things Done to Cards. My least favorite card was 1989 Topps Mike Witt with an imprint of a gum stick - reminding me my bad old days of collecting an overproduced, crappy Topps brand featuring wafer-like stick of gum that took the strongest of teeth to break down and chew. There was also a note about the box - it was apparently used to ship a vintage card of Roy Campanella purchased 16 years ago. I know a box doesn't have anything to do with the contents inside, but it is still interesting to read the note. Angels fans knew how this was going to turn out and instead of being a pariah in Anaheim the [animosity over a signing long-term deal, mound/celebration antics, 'nervous save' moments] - Francisco Rodriguez can have a fresh start in New York [providing his arm doesn't pop off]. He was pushed out the door, but as I thank him for his service in Angels' organization for 10 years - it is time to move on. You figure he has done all he can - helped the Angels to a 2002 World Series Championship and set the bar with his single-season saves record. While it falls a bit short of what he and his agent were probably looking to get - K-Rod got his money [about $37 million] and also three years to close for a New York Mets team that was desperate for a star reliever / closer type. I'm sure there are Angels' fans rejoicing the moment K-Rod inked his deal with the Mets - but there is always a caveat. 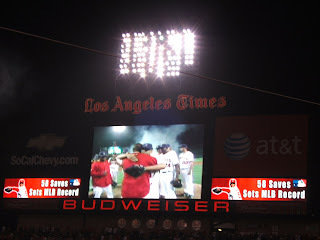 I have trust in the Angels' organization to replace him but the time is now for either Jose Arredondo or Scot Shields. 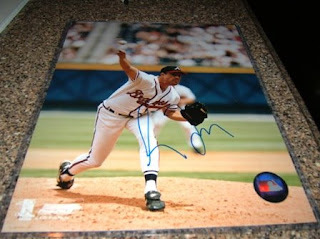 Greg Maddux signed this autograph in-person when he was still with the San Diego Padres a couple of years back - his autograph has never been much, but I was glad to get him anyway. In the last part 10 years of his career Maddux has seemed to be under the radar, but with Roger Clemens' career 'tarnished forever,' Maddux maybe considered the greatest pitcher of his generation - it says something that Maddux was at his very best when offense in Major League Baseball was booming and Clemens was sputtering in last four or five seasons with the Boston Red Sox. I was looking through stacks of cards at a twice a week card show and saw a 2008 topps Triple Threads autograph/patch/bat [serial #'d 18/50] of Ryan Zimmerman - it was $15 and I wasn't going to pick up, though I thought the patch pieces popped out. One of things I want is build up a 'scavenger's personal collection' of cards - which is to say I'm looking for singles [autographed, game-used, rookies] in the $10-$40 range I can probably put away in my collection for the next 10 years. I'm not a Washington Nationals fan by any means and I would have left the card alone - if it featured someone like Dmitri Young, Cristian Guzman Austin Kearns, Paul LoDuca or some other mediocre player the Nationals have put out on the field in recent seasons. Zimmerman was a hot rookie back in 2006, but after an OK sophomore campaign in 2007 - he was banged up and played in only 106 games in 2008. With what I typically pick-up [scrap commons, maybe a random pack or two or something else] at a show I wouldn't be able to pick up something nicer than the Zimmerman - though the card does seem a little gaudy. The green just doesn't do anything for me, aesthetically. The autograph featured on a card was on a sticker - and the autograph seems typical of what the style of autograph he has signed for trading card companies in the past year. PS: I probably get about 10 page views per two days compared to hundreds for probably some bloggers, each day - but my Internet connection is screwy at best and I have not updated the blog as much as I probably can. At the very least, I probably haven't been able to visit my favorite card blogs with regularity - to see what other collectors have to blog about lately.